Woodbridge, VA-With a slim lead heading into the home half of the eighth inning in the decisive game five of the Northern Division Championship Series, the Potomac Nationals (3-2) got a grand slam from 1B Aldrem Corredor in route to a 6-2 win over the Lynchburg Hillcats (2-3) on Sunday night. The win secured Potomac the 10th Northern Division Championship in franchise history, and set up a matchup with the Buies Creek Astros (Houston) for the Mills Cup. The Carolina League Championship Series is set to get underway on Tuesday night in Buies Creek, NC. The game got started after a rain delay of 5:09 and featured a first inning power delay of 15 minutes. In the finale of the five game series, the visiting Hillcats jumped out to an early lead, but for the second consecutive night, failed to hold the advantage. 1B Anthony Miller singled with one out off of RHP Jackson Tetreault (W, 1-0) in the second inning, and scored two batters later on an RBI double from 3B Jorma Rodriguez. Rodriguez had the only two RBIs of the game for Lynchburg, as he got his first start of the series. Tetreault settled in and allowed just one run on three hits over five innings, as he turned the ball over to the Potomac bullpen. Trailing heading into the bottom of the fourth inning, Potomac finally got to RHP Eli Morgan (L, 0-1). 3B Ian Sagdal led off the inning with a single, and he scored one batter later on a double by C Tres Barrera paired with an error by LF Mitch Longo. A groundout by Corredor moved Barrera to third base, and he scored the go-ahead run on a wild pitch from Morgan. The wild pitch gave Potomac a 2-1 advantage, a lead that Potomac held through the rest of the clinching victory. After five frames from Tetreault, LHP Ben Braymer dominated over three-shutout innings for Potomac. The left-handed reliever allowed one hit, issued one walk, and struck out six, as he tallied his second three-shutout inning performance of the series. Braymer struck out 13 batters and didn't allow a run in his two appearances in the series vs. Lynchburg. Potomac got a leadoff single in both the sixth inning and the seventh frame, but failed to push across an insurance run in each trip to the plate, as RHP Robert Broom got through the sixth inning, and LHP Anderson Polanco got through the seventh frame. Polanco returned to the mound for the Hillcats in the eighth inning and quickly retired DH Bryan Mejia . SS Luis Garcia , who had two hits earlier in the game, drew a walk, which ended Polanco's night. RHP Dalbert Siri, a Carolina League Mid-Season All-Star, entered to pitch with the heart of the Potomac lineup set to step in. Siri faced six batters but got just one out. After Siri fell behind Sagdal 1-0, his second pitch of the plate appearance got passed C Gavin Collins. The passed ball allowed Garcia to advance to second base, which led to an intentional walk of Sagdal. Barrera then drew a five-pitch walk, which loaded the bases. Corredor, who had five home runs in 59 regular season games for Potomac, launched a ball over the left field wall for an opposite field grand slam. Corredor's grand slam gave Potomac a 6-1 lead in the eighth inning. RHP Jacob Condra-Bogan allowed three singles and a run in the ninth, but fielded a ground ball hit by SS Alexis Pantoja and made the throw to first, which secured Potomac's victory and a chance to chase a sixth Mills Cup Championship. The Carolina League Championship Series is set to begin on Tuesday in Buies Creek, NC. First pitch at Jim Perry Stadium on Tuesday is set for 6:00pm. The Potomac broadcast will get underway at 5:45pm with the P-Nats Leadoff Show. You can listen to the Potomac broadcast at potomacnationals.com or at http://bit.ly/2018P-NatsPlayoffs. The Potomac Nationals of the Carolina League, play at Northwest Federal Field at Pfitzner Stadium in Woodbridge, Virginia, and are the Carolina League affiliate of the Washington Nationals. 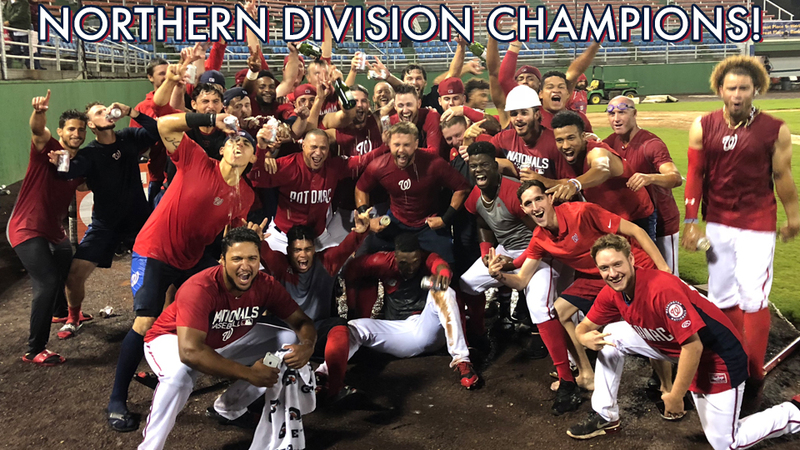 The Potomac Nationals have claimed five Carolina League Championship titles (1982, 1989, 2008, 2010, and 2014) and nine CL Northern Division Championships. Sponsorship opportunities for the P-Nats' 2018 season and beyond are available, as well as all-inclusive corporate picnic outings to watch the future stars of the Washington Nationals at The Pfitz. 2018 Potomac Nationals season tickets and mini plans are now on sale. For more information on Potomac Nationals 2018 season tickets, mini plans, group outings, picnic packages, fundraisers, and all things Red, White, and Blue, visit the P-Nats online at www.potomacnationals.com, follow the P-Nats on Facebook (@PotomacNationals), Twitter (@PNats42), and Instagram (@pnats42), or call the Potomac Nationals' Extreme Custom Collision Ticket Office at 703-590-2311.